Pricing includes free ground shipping except for tri-folds. Our online order form will show you shipping options and pricing. 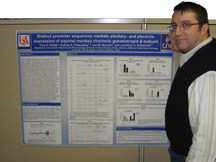 We offer free 2 Day shipping for orders of two or more scientific research posters. No matter what size you choose, there is always a 10% discount on orders of 5 or more research posters ordered together. We can print special sizes up to 60 inch width and 30 foot length. If you want us to do the poster layout, we can do that too. Call for special sizes and pricing, 800-590-7850. A convenient way to carry and protect your scientific poster. Tubes are 3" diameter plastic and "telescope" to hold 36 or 48" poster sizes. Your poster goes back into the tube easily! Includes a carrying strap. This is a more durable leatherette bag that holds your scientific poster in a cardboard tube. It comes in 36" and 48" sizes. You can fold the bag to go into your luggage for the journey home. We put your poster in a tube, and the tube goes into the bag. It has both an adjustable carrying strap and a handle, and closes with VELCRO® hook and loop. Please choose a material Matte Paper Glossy Paper Glossy Laminated Matte Laminated Foldable Fabric 30"x40" 36"x48" Glossy Laminate 36"x48" Matte Laminate 36"x48"
Shipping charges are calculated on step 2 of our online ordering. Prices effective January 1, 2017 and subject to change without notice.